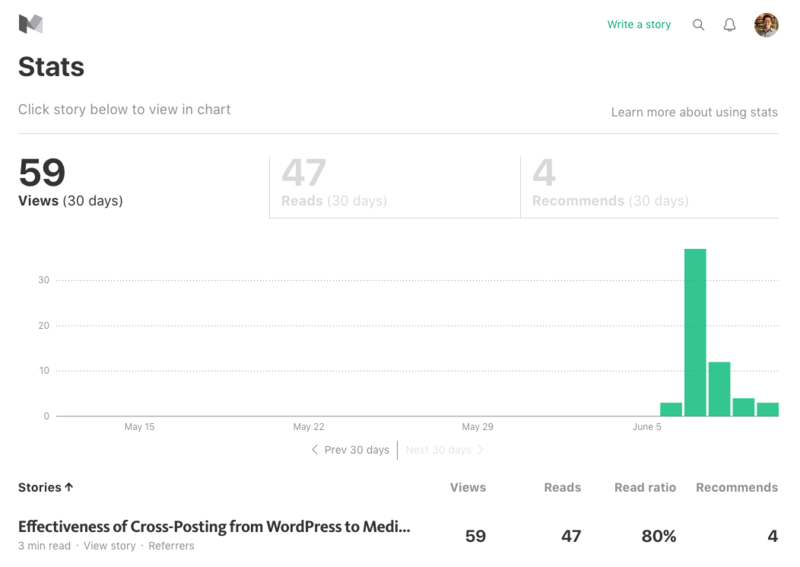 This is a quick follow-up report on my quick test about the effectiveness of cross-posting from WordPress to Medium posted a few days ago. I have been observing the stats on both the Medium post and my blog post for a few days. I conclude that it is an okay time to give a quick report on what I learned from this testing. Medium gives you exposure. 20% of people visited my blog. Over the past 4-5 days, 59 people viewed the article on Medium. 80% of them actually read it through and 4 people favorited. Out of four, one is me. To me, 59 viewers were quite impressive number given that my Medium account has been dormant for years. 80% reading ratio is also probably high, but the article itself is quite short anyway. The number of daily viewers changes like [3, 37, 12, 4, 3]. I then compared it with Google Analytics. Over the same period, the [1, 6, 2, 1, 2]. Although the referral information was not captured in my current Google Analytics, I suspect that these two trends resemble each other. Based on this observation, I conclude for now that about 20% of people who read my article on Medium will visit my blog. There are a few things to think about further. Will this conversion rate increase or decrease as my readership grows on Medium? My guess is it will decrease as only new readers will visit my blog out of curiosity and old readers will have no reason to do so. I guess for popular Medium writers the ratio will be even below 10%. Time lag is another dimension to consider. As Sarah Cooper mentioned in her comment, if I post an article on Medium with a delay of a week, what will happen. I don’t think it will affect the click-through rate to my blog per se. But, it may influence search engine results in case Google thinks my blog primarily carries duplicate contents only. First of all, I think Google is smart enough. Second, there seem to be some work-around for this type of cross-posting across blogs. The Medium WP plugin in fact adds “canonical” link header in their page, so I am not worrying about timing too much right now. Mention some people that you want to get along on Medium. One thing I was very happy about this process is that Sarah Cooper was the first person who commented on my post! This is exactly what I like about joining a new platform in its early days. You can engage with people that you will not hear back from on Facebook or Twitter. If I were to start following President Obama from Twitter today, I would be one of his 76 million followers. At Medium, I would be one of 12k follower. Ignore both numbers are practically zero. The difference is of a few orders of magnitude. To mention in your writing some people that are active in Medium and that you are interested in getting along is a good way to keep you motivated and also boost the initial exposure. Having some initial followers must have helped. I also had about 80 mutual followers imported from other social media–Twitter I think–when I first created an account at Medium. Having those initial followers must have helped as well. My advice is to start following some people on Medium and reading what they write. The more I spend time with reading, the more I feel embedded in this growing community. Activities like following, reading, commenting, liking, etc. will help bootstrap the initial set of followers. In summary, it was an interesting test for me and I hope it can shed a light on how traffic looks like when you first start blogging and using Medium. Although I am by no means a professional blogger, I look forward to meeting and interacting with people at Medium on occasion. As I was preparing to restart my WordPress blog, I wondered what syndication options I could have for new posts. I synced my blog with Twitter and Facebook a few years ago, but I stopped updating Twitter and Facebook for a while. I learned about Medium a few years ago and I always thought I would try out the platform one day. And, today is the day. Once I decided to try Medium, a few thoughts crossed my mind. Is posting duplicate articles on both WP and Medium allowed? The key difference of Medium from Twitter and Facebook as a syndication channel is that it is a full-fledged platform dedicated to online publication. When I used Twitter and Facebook, they served mostly as a notification system: notifying my followers about a new post and the link to it. At Medium, on the other hand, the norm seems to be posting the entire article on the platform. This may create a SEO problem. From googling, some people recommend publishing on Medium a few days later than your original post is out on WordPress. Others recommend repurposing the article specifically targeting the Medium audience. For now, I will rather publish an almost identical post on Medium and see what happens. Still, I will selectively send articles to Medium. Not all short notes need to go to Medium. There seem to be quite a number of people using Medium as a syndication platform for their WordPress blog. One example (biznology), another example (Sarah Cooper), another (Jared Stein). It is hard to find the list of all WordPress bloggers who send their posts to Medium, but many people seem to be using Medium as a content distribution platform for sure. Maybe I will be able to meet some people doing the same thing there once I start using Medium. In fact, there is a seemingly official WordPress plugin from Medium. I had to go through a few steps before getting it working like putting in the access token, but overall the process was very straightforward. I will see if it works by publishing this post. If you are reading this article on Medium, it means the plugin worked at least for me. One reason of this inaugural post is to see how many people actually visit my WordPress blog through Medium. Right now, both my blog and Medium account are in a clean slate. This blog is (almost) blank and my Medium account is literally blank. Using Google Analytics, perhaps I can check where people are coming from. Once I get to have some sizable statistics, I will write about it. Please leave a comment (only on Medium) about what you are interested in. I will try to incorporate those requests when I get to write about it. I came across a blog that can be a model of what I am envisioning for my small blog. It’s called BPS Research Digest. Although it is a authoritative blog published by the British Psychological Society and my blog is just by me, I would like to use this space to review the paper I found interesting in the manner that BPS presents. From reading this post, a general structure I could write is as follows. If I can write this way, this alone will amount to 600-700 words. I hope it will be a good exercise for me to learn how to shape a good research question. I barely met the writing quota (500 words) today. This is now six days in a row. Trying to meet such a certain quantitative threshold helps me visualize the progress. So, I start to feel that this daily writing goal almost has an additive feature. Once I get used to it, I will keep raising the bar by 100 until I reach 1k words per day. At the same time, I realized that writing a blog post like this one is so different from writing a paragraph in my paper. I don’t know if I can ever write a part of a research paper as fast as I am writing this post. It has been a super painful week for me writing a draft for thesis proposal. I should have started at least one week earlier. Regarding writing, I always underestimate the task and overestimate my capability. Writing to a deadline deprives the joy of creation and organizing. It was a good wake-up call. Now I started logging word count every day and it has been 6 days. I pledged to write to a quota every day. The quota currently sets at 500. I plan to lift it to around 1k-2k. Another realization is that writing is really tough thing and if I reserve writing for later of the day, I won’t do it at last. Last two days, I woke up early around 5:30 and wrote whatever I can until I hit around 200-300 words before taking a shower. This really turns on the writing mode in my brain for the day. Hopefully, I can keep this pattern for a while. I ran across an advice from a professional novel writer. He talks about the triangle as a requirement to jack up your writing speed: knowledge, time, and enthusiasm. I don’t get it much for enthusiasm, but I fully agree on knowledge and time. By knowledge, he means to prepare bullet points of what you are going to write spending 5 minutes before you start writing about something. For time, he emphasizes on tracking the output performance in terms of word count. In his case, writing during afternoon at a coffee shop without internet works best, so he rescheduled everything to write at that time frame and viciously protected it. These are good advice, though I don’t expect me writing 10k words a day. In my case, I need to actually “do” some research–data processing, running regressions, and literature review. Nevertheless, I think I can do better than the current word count, 1.5k per day if spend the whole day.